The final weekend of Macron East Sussex Football League action in 2017 was the most disrupted of the season so far. The bad weather of the preceding week caused more than half of the scheduled matches to be postponed, but 13 games did still go ahead. AFC Hollington take on Battle Baptists thirds in Division Five. With the Premier Division’s top two heading into last weekend having their fixtures called-off, Rye Town had the chance to go top with a win at home to Robertsbridge United. But it wasn’t to be as the teams fought out a 2-2 draw for the second time this season. Rye moved above Battle Baptists into second place on goal difference and are a point behind leaders Hollington United having played a game more than both. Guy Ballard and Curtis Coombes put Robertsbridge two-up inside 11 minutes, but Rye struck twice in the final quarter of the contest through Luke Willis and Lewis Carpenter to ensure they went the whole of 2017 undefeated in all competitions. Elsewhere in the top flight, Bexhill Town jumped above Robertsbridge into fourth place on the back of a 2-1 victory at home to St Leonards Social. A Battle Baptists third team player slides in on an AFC Hollington opponent. A Doni Dovla double gave Bexhill the points against a Social side which had a player sent-off near the end. Hawkhurst United rose to seventh courtesy of a 6-1 success at home to Ore Athletic. Paul Channer plundered a hat-trick, Gregory Daniel bagged a brace and Steven Filmer got the other for Hawkhurst, while Will Spice claimed Ore’s consolation. Northiam 75 will enjoy their Christmas after extending their lead at the top of Division One to nine points with a tremendous 11-4 victory at home to Hastings Rangers. Aydin Janes plundered four goals, Scott Embery netted a hat-trick, and Steve Housago and Oscar Garcia Cruz bagged two apiece in a great Northiam performance. Embery, incidentally, is the leading scorer across all six divisions with a remarkable 22 league goals. A Bexhill Town player tries to block a pass from a St Leonards Social opponent. Mountfield United missed the chance to climb into the top half as they were beaten 4-3 away to a Rock-a-Nore side which is now out of the bottom two. Strikes by Harry Cawkill (2), Thomas Felstead and Jack Franklin gave Rock-a-Nore the points. Neither of Division Two’s top two were in action, but Peche Hill Select advanced to third via a 4-2 victory away to Bexhill Rovers. Ryan Rankin, Jack Godden, David Benson and Gary Taylor were on the scoresheet for Peche. Battle Baptists II, who began the weekend second-bottom, moved up two places thanks to a 4-1 victory away to sixth-placed St Leonards Social II. Thomas Cann (2), Sam Loughman and Joshua Reuter scored for Battle. AFC Hollington and Battle Baptists thirds tussle for possession. Division Three leaders Punnetts Town made it 10 league wins out of 10 without even kicking a ball as scheduled visitors Ticehurst were unable to field a team. Second-placed Sedlescombe Rangers II dropped two points below Punnetts after being held to a 1-1 draw at home to seventh-placed The JC Tackleway II. Liam Baker’s goal for Sedlescombe, who have played three games more than Punnetts, was cancelled out by David Burch’s strike for Tackleway. Sandhurst jumped up to fourth after ending the calendar year on a high with a 5-0 win at home to Magham Down. Andrew Turner helped himself to a hat-trick, and there was one apiece for William Mantle and James Chambers. In the one Division Four encounter that went ahead, third-placed Bexhill Broncos had to settle for a 2-2 draw away to Cranbrook Town. Jamie Crone and Jack Hickman were on target for the Broncos. There were some festive surprises in Division Five as the two teams who have dominated the division so far this season both failed to win. Bexhill Town and St Leonards Social battle it out. 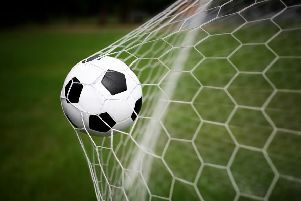 Leaders Sedlescombe Rangers III, who began the weekend with 31 points from a possible 33, suffered their first league defeat of the campaign, losing 1-0 at home to third-bottom Northiam 75 II. Hayden Reed was Northiam’s match-winner. Second-placed Hampden Park failed to capitalise, though, as they were held to a 2-2 draw away to mid-table Icklesham Casuals II. A win would’ve put Hampden Park top, but instead they are two points behind Sedlescombe. The goals of Solomon Cooke and Kieran Dighton for Icklesham were matched by Eddie Dunn and William Coles for Hampden Park. Battle Baptists III rose to third by dint of a 4-1 success away to AFC Hollington. Harry Loates (2), Matthew Ward and Ben Kempner were Battle’s scorers. Declan Loft netted for Hollington. The league is now on its festive break and the action will resume on Saturday January 6. An AFC Hollington player closes down the Battle Baptists thirds man in possession. A St Leonards Social player holds off a Bexhill Town opponent.